they're just not making it to my blog. with a slightly different head shape. just enough to keep my creativity sparked. 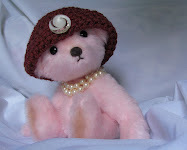 and post daily on my Pretty Pix blog. actually a wonderful mix ! Hello .. I'm still making bears ! 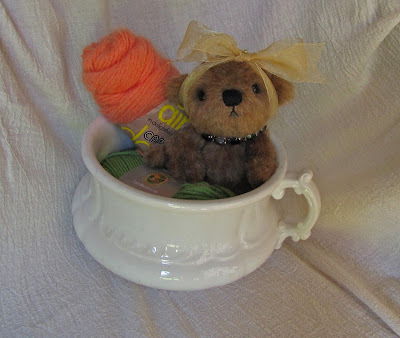 Kindly meet Pickles, my latest creation. is jointed, has black glass eyes and an embroidered nose. and has soft leather foot pads. he'll wear it for me. What a sweetie ! He's off to romp with the hug, which is all still here, happy and playful as ever. He has several new brothers and sisters, but they all seem to be a bit camera shy. far too much to ever stop ! I’d like to intoduce Bubblegum, my newest little creation. Bubblegum is a happy lad, very outgoing and very friendly. He’s 7 inches tall and has the softest fur. He has leather foot pads, black glass eyes, and a little embroidered nose. 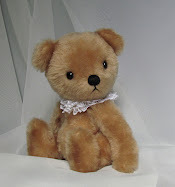 Bubblegum is fully jointed enabling him to freely play with our ever growing hug, who have welcomed him with open arms. Bubblegum was a joy to make. Watching his little face emerge from this somewhat unruly fur was a true delight. 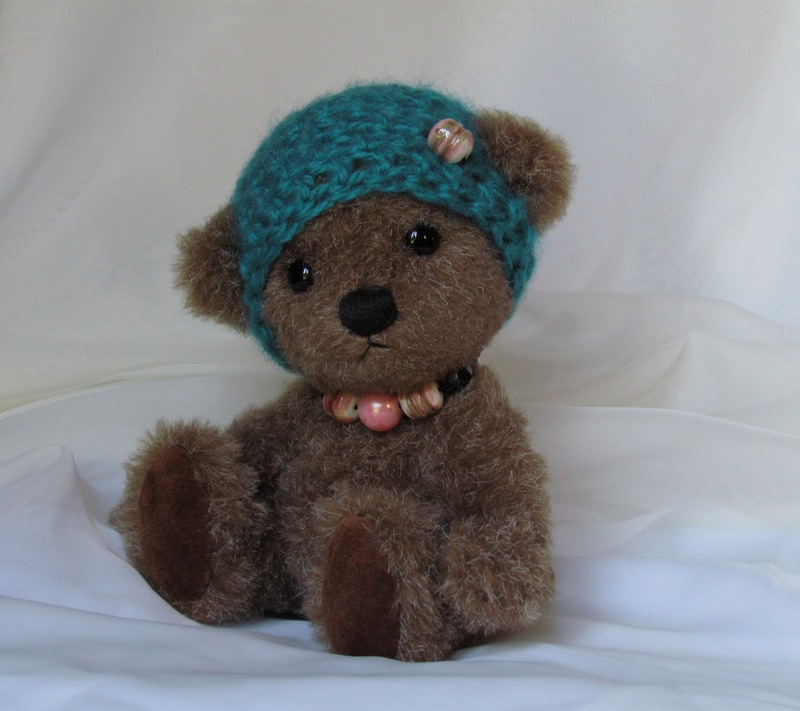 I love making my bears and will continue creating them.. until my fingers all fall off. Kindly meet Miss Poppy, newest member of our hug. Miss Poppy is a panda wanna-be, kinda sorta. 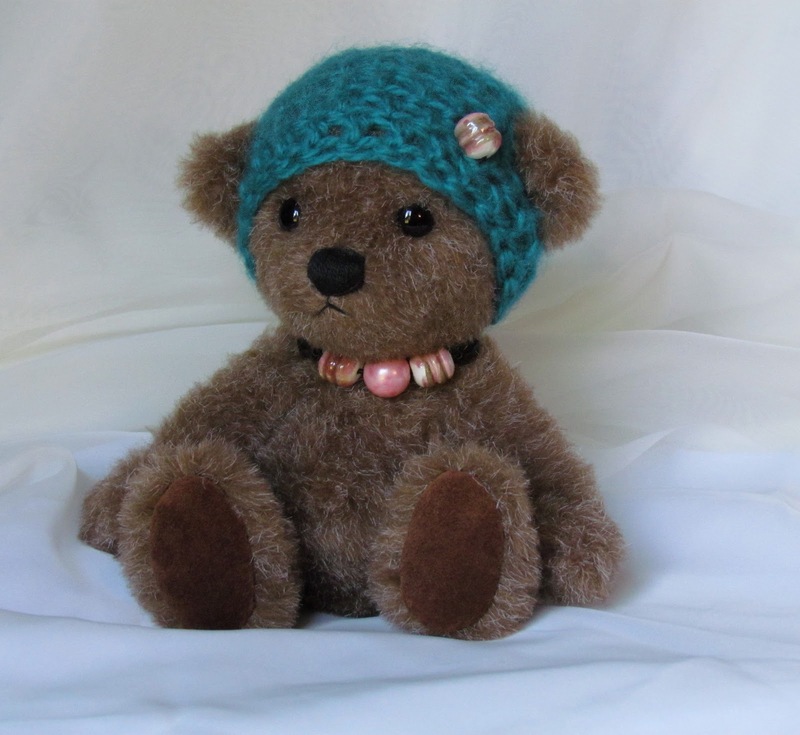 She measures 7 inches in height and was made from vintage faux fur coats. She's fully jointed, has black glass eyes and an embroidered nose. Her foot pads are black leather, from a vintage jacket. She is cuddly soft and as sweet as can be. It’s two in the morning, so she’s fast asleep, snuggling with the hug. 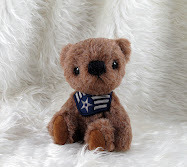 I’d like you to meet Tobias Tenderheart, my newest little teddy. Tobias is 7 inches tall and made from a wonderful sparse fur of some sort. 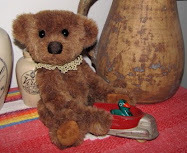 He sees the world through vintage shoe button eyes and enjoys the sweet scent of flowers with his little embroidered nose. Tobias is a gentle lad, rather on the shy side. He loves poetry and daydreaming. And with his wispy smile and vibrant fur, Tobias is turning a head or two. One secret admirer left a Love pendant on his pillow, which he’s shyly but proudly decided to wear. Love is in the air! I’ve found a peace, a quiet still place, inside myself. I know I won’t always be able to find it, as it can be elusive, but I’ll henceforth always try. Meet Sebastian, newest member to the mob, I mean hug. Little Sebastian was made from, well I’m not really sure. It’s a funny fuzzy thinnish fur I found at a garage sale. I wasn’t sure about it, but to my happy surprise it worked out well. Sebastian thinks so, too. Sebastian has a center head seam, one of my older patterns I tweaked just a bit. 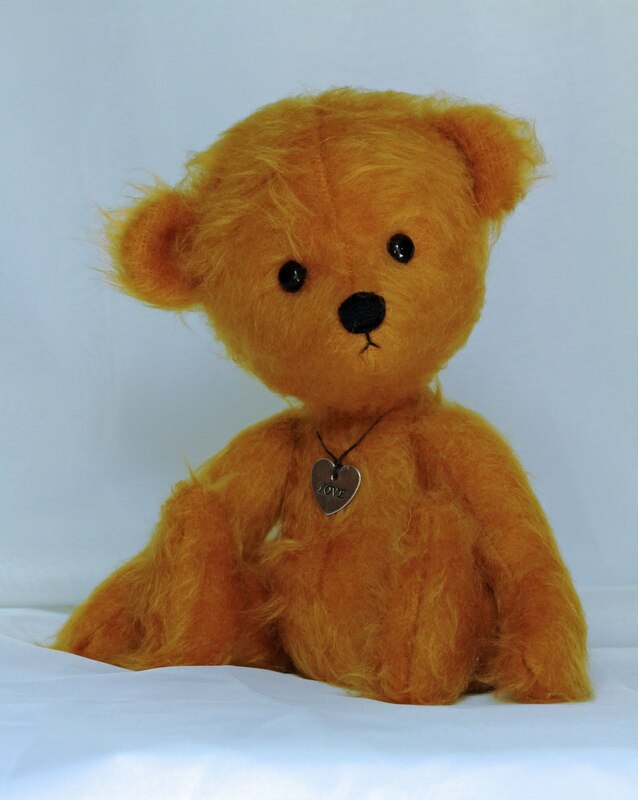 He’s 7 inches tall, has vintage shoe button eyes and an embroidered nose. Oh and he’s fully jointed, to swing that bat and catch that ball. They started a baseball team. There go the windows. 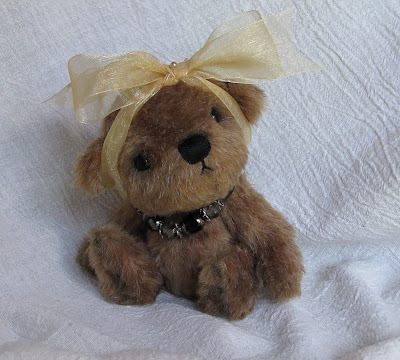 I gave Sebastian a frou-frou feathery thing to wear around his neck. It was black, so I thought perhaps maybe... But he protested loudly, so I replaced it with a key, which he finds very cool. 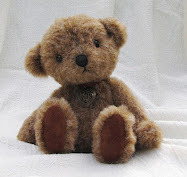 I’ve started another teddy, well two actually. One with longish fur and one with sparse fur. I think I’m on a roll! But right now I’d best go play referee. Has Spring sprung in your corner of the world? Ours is very slow to show, but I’m sure it’s just around the corner. Please meet Pattycake, my newest little ball of fuzz. 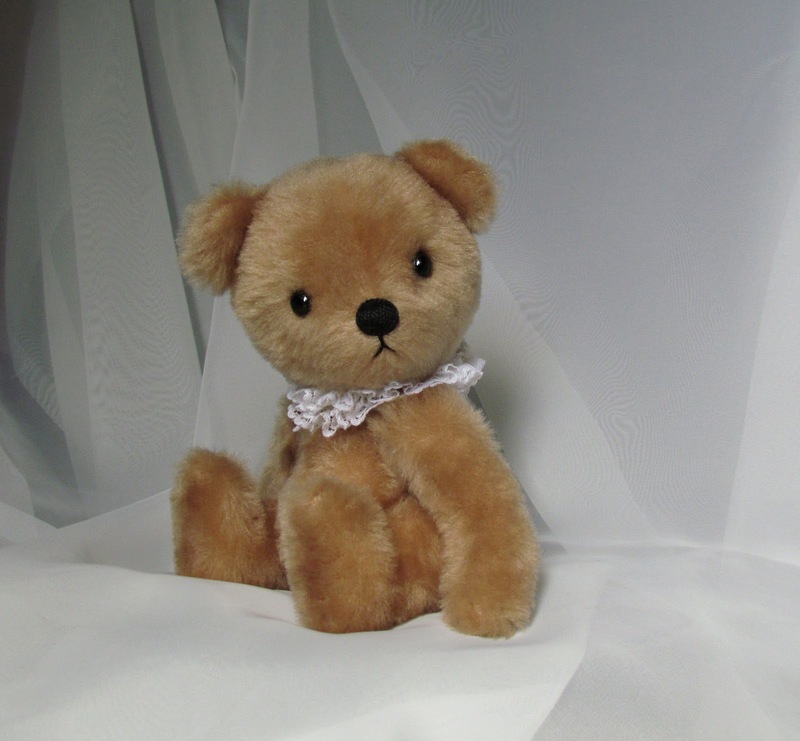 Pattycake is about 7 inches in height and made from a super soft faux sheepskin kinda fur. 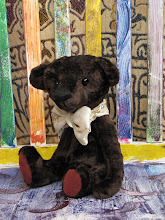 She is five-way cotter pin jointed, has leather suede foot pads, black glass eyes and an embroidered nose, slightly waxed. Pattycake has joined the hug and is at present teaching everyone, well.. how to play pattycake. 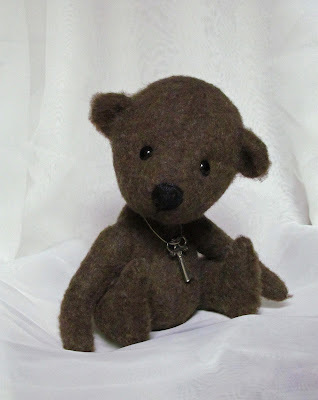 I’ve finished another little fellow, who goes by the name Sebastian. He isn't fuzzy, but he is a bit shy and runs when he sees the camera, so he's yet to have his photo shoot. Maybe tomorrow. I'll need to bribe him! Kindly meet Cotton Candy, pretty in pink! Cotton Candy is 8 inches tall, sees through vintage shoe button eyes, and has a cute little fuzzy wool nose, embroidered and gently waxed. She’s wearing a strand of pearls and a little beanie hat I crocheted just for her, with a vintage button she picked out. Little Cotton Candy is now living and playing with our ever growing hug, and is so happy to finally be a complete and real teddy bear. She's been very patient with me. 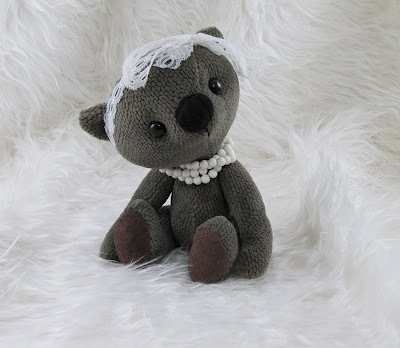 I have another teddy in the works. It’s wonderful to be creating again. I lost my spark, my mojo, for a while. I’m happy to have found it again. As is the hug. I’d like to introduce Sammy Snowflake, a very soft and cuddly little fellow. Sammy was made from a vintage fur coat and looks to be wearing one, with his little face peeking out. 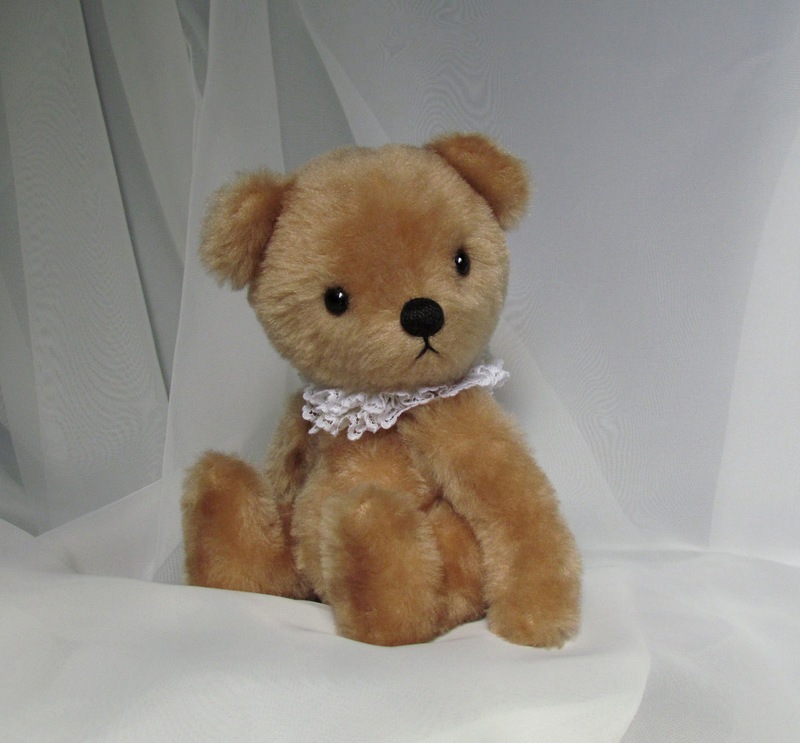 Sammy is 8 inches tall, has leather suede foot pads, shoe button eyes and a pearl cotton embroidered nose and mouth. I crocheted him a little red scarf. He’s a very special little guy, as I finished him the day before my dad passed away. I think my dad would have liked him. Thank you for your warmth and kindness. It helped more than words can say. Kindly meet my newest little creation, Poindexter Puddlejumper. 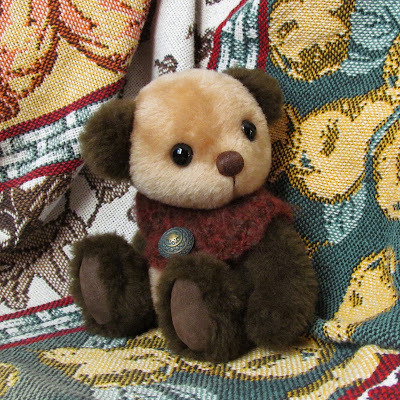 Poindexter was made from a vintage honey brown faux fur coat and has a traditional center seam head. He stands 7 inches tall and has a cute little tummy. 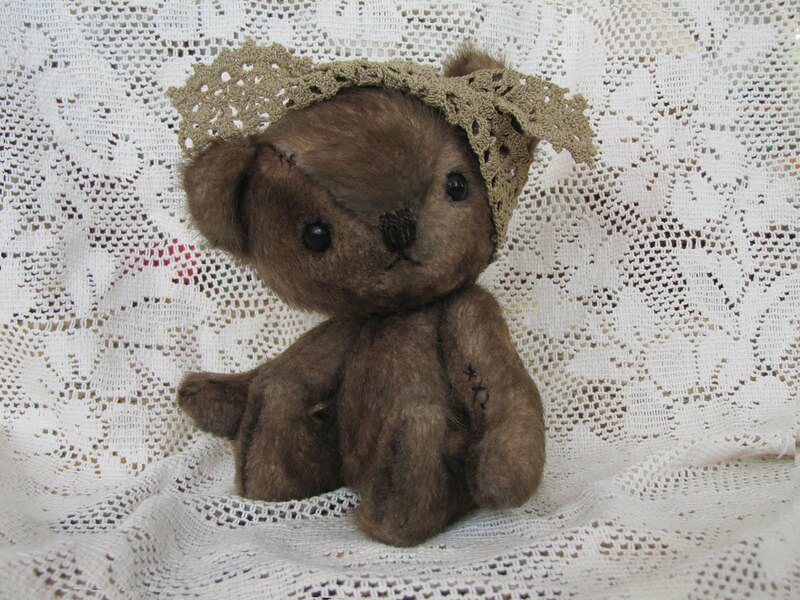 He has vintage shoe button eyes, a pearl cotton embroidered nose and mouth, and is fully jointed. Poindexter was really fun to make. 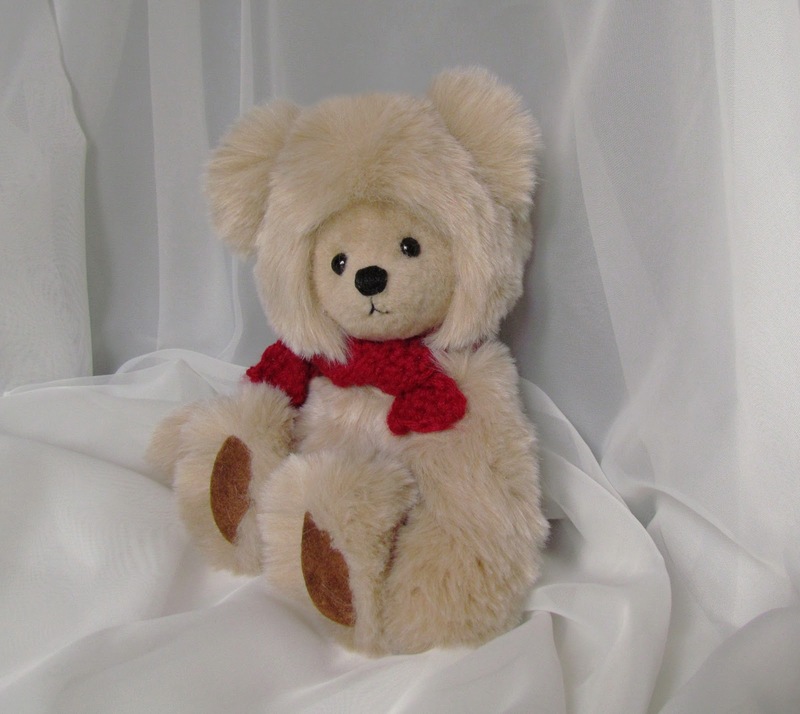 I’m working on a longer fur teddy, trying something a bit different. I put his eyes in today and he’s really making me smile. He just needs a slight nose waxing, a bit more trimming, and he’ll be ready for the name game. Another week just flew by, so fast I could hardly keep up with it. That‘s okay, the weekend’s almost here, and I love weekends. Hope yours will be filled with fun and good times! I’d like to introduce my two latest creations..
Tuck is about 6 inches in height and his big brother, Piccadilly, is about 8 inches. 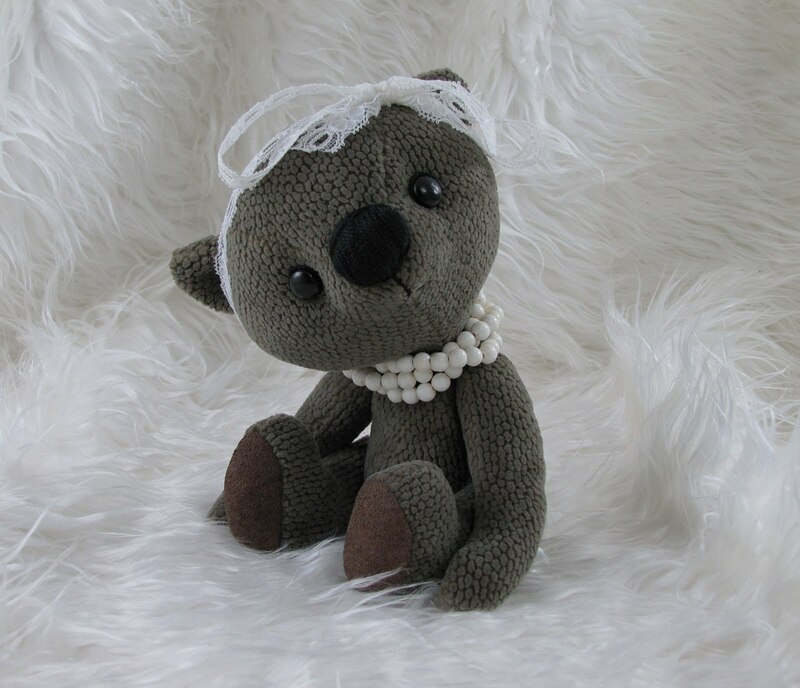 Both have premium black glass eyes, embroidered pearl cotton noses, and are fully jointed. They were made from vintage faux fur coats, their foot pads from leather coats. I really like these two-tone, wanna-be pandas. I think I’m hooked. 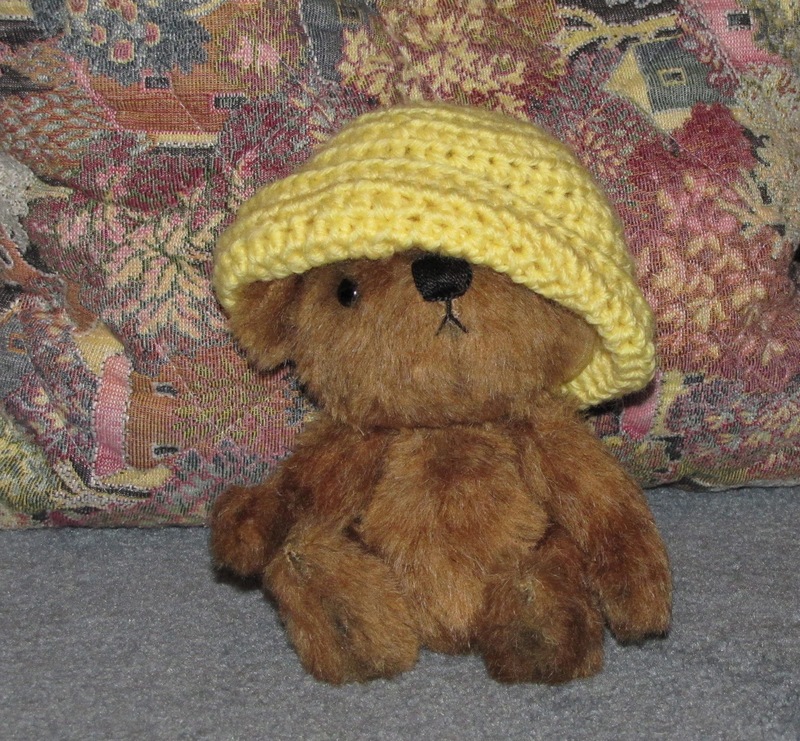 Speaking of hooked.. I’ve been crocheting lots of whackadoodle teddy bear hats, none quite ready for prime time. One of these days I’ll crochet what my mind’s eye sees, I hope. I’m getting closer, I think. It’s fun to experiment, and yarn thankfully, is cheap. And crocheting is sooo relaxing. 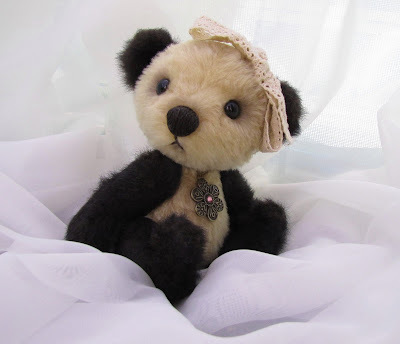 Kindly meet my newest creation, Pandora Pumpernickel, my first wanna-be panda. Pandora is made from two vintage coats. She has a center seam head and is fully jointed. 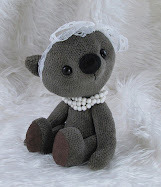 Her eyes are premium black glass and her nose was embroidered with pearl cotton. Pandora stands 7 inches tall, dons a vintage lace head bow and a vintage earring around her neck. I don’t know why I haven’t made a wanna-be panda before. Now I know what to do with all my too dark fur. It’s nice having other mediums to go back and forth to. I’ve started crocheting hats for some of my teddys. Crocheting has been amazingly enjoyable. Who knew! I hope your week is off to a good start. It’s a drizzly ol' day here.. my kind of day! 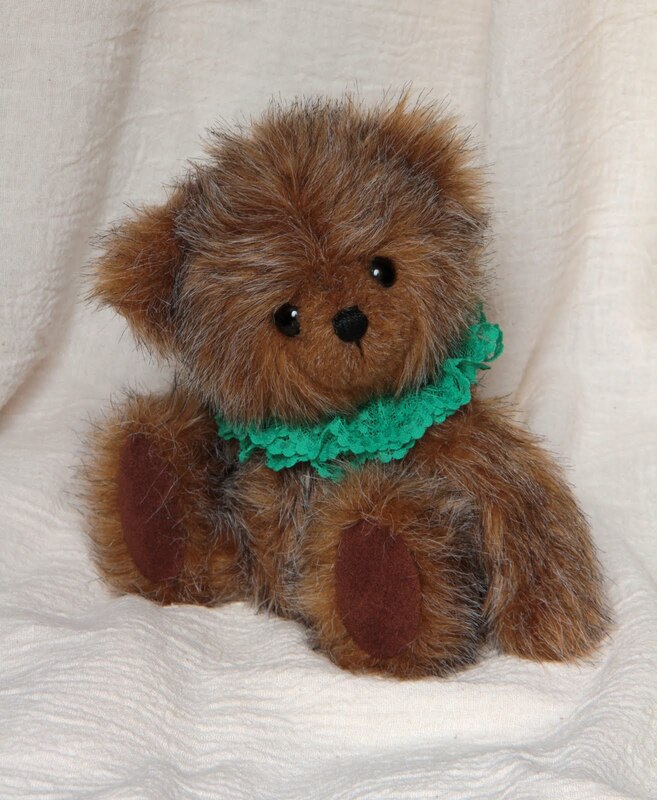 I’m delighted to introduce Tattie Tumwater. 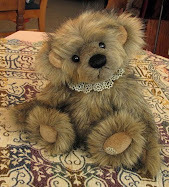 Tattie is a shabby-chic bear. 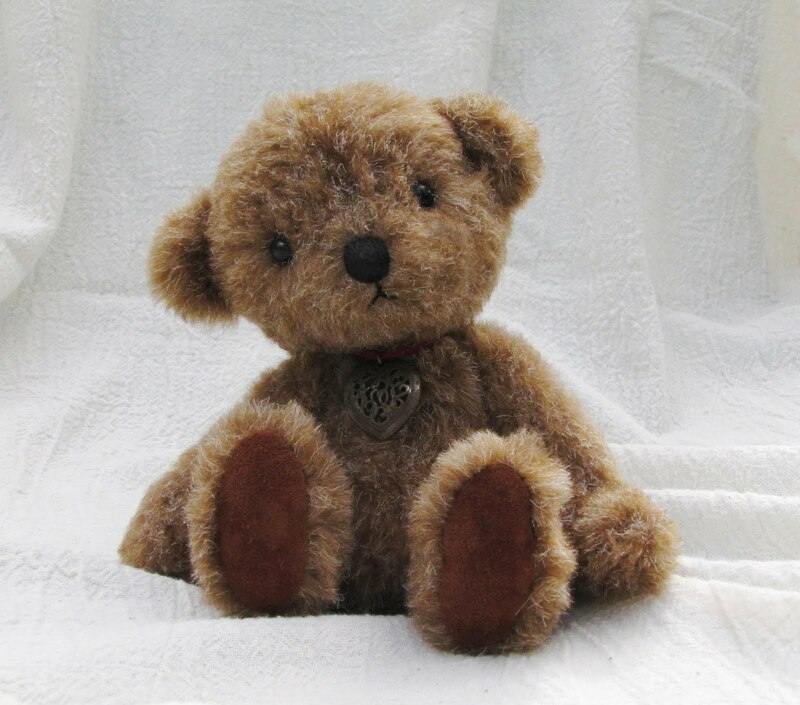 My first in this style, which I’m calling my Tatty Teddies. I love this scruffied-up look! 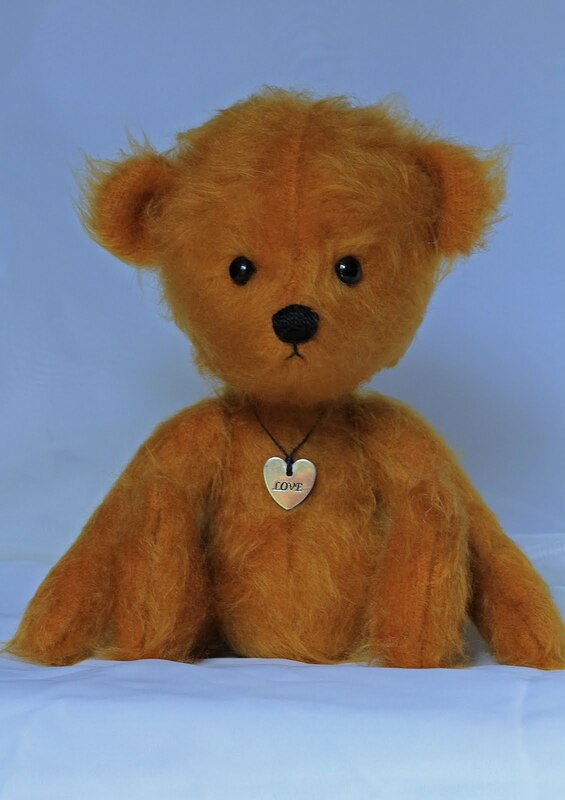 Tattie is made from a recycled faux mink coat. Wispy and a bit sparse, it was the perfect fur for that careworn look. She’s 7 inches, from head to tippy toes, fully jointed, and peers out through shoe button eyes. Tattie was really fun to make. 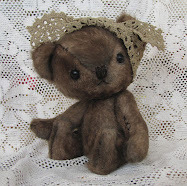 I know I’ll be making more Tatty Teddies. Summer is nearly over, can you believe that! Time is just flying by. I’m very pleased to introduce Joey Whippoorwill. Joey is my first center-seam, no gusset, teddy. I’ve been playing around with this pattern for a while now. My mind’s eye design wasn’t transferring to paper, or fur, with stealth speed. More like tortoise speed. But after much trial and error I finally came up with a pattern I like. Not to say I won’t be tweaking it a little, now and again. Joey is 8 inches tall when standing. 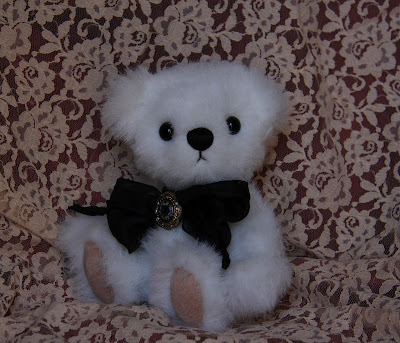 He has a cute little pearl cotton nose, old shoe button eyes, and is 5-way cotter-pin jointed . He’s made from a very soft faux fur and has leather suede foot pads. Joey is organizing a softball game, at present. They’re choosing up teams. It sounds a bit girls team, boys team. Not sure how that’ll work out. But the girls are sounding very confident, so we’ll see. Someone just discovered my wooden spoons make great bats. I wonder where they’re planning on playing. Maybe I should go find out. Kindly meet Miss Prudence, all 6 inches of her. Her loveliness was made from, well I really don’t know what. It was a piece of fabric found in a bundle I bought at a garage sale. It’s heavy-ish and has a soft fuzzy texture. Upholstery fabric? Dunno. She was fun to make, and she's fun to look at. And quite the character.. Please meet Nibblet, my newest Weebundle. 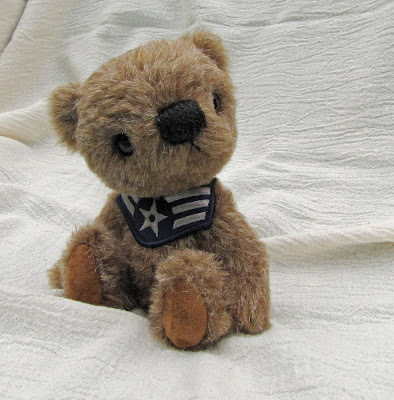 Nibblet is 7 inches tall, standing (which he can), was made from a wonderfully soft faux fur, and sports a military insignia patch thingy. Nibblet’s photo shoot was a challenge, to say the least. I never did get a good shot, I finally had to settle for so-so. 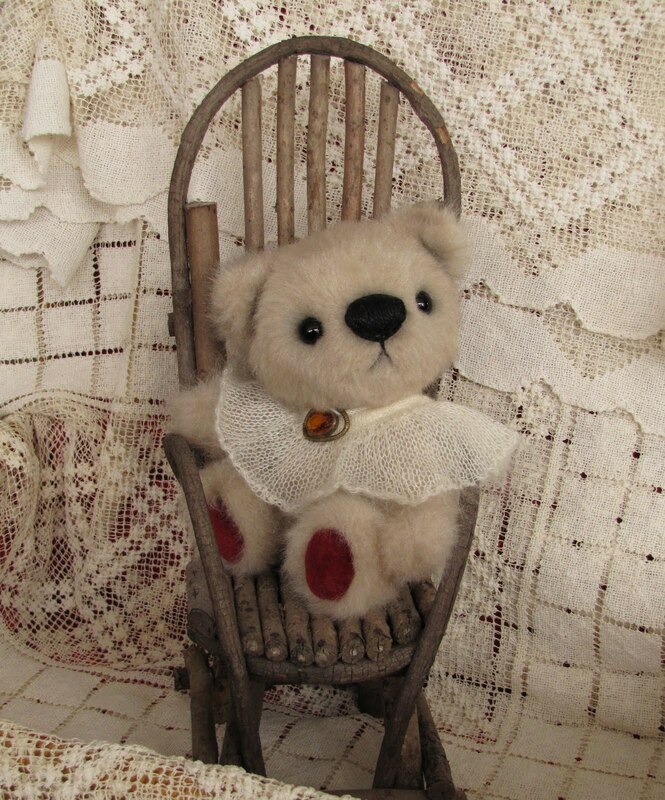 Nibblet was sitting pretty on the folding blue lounger, pictured above, all ready for his photo shoot. Clever me decided to straddle it for a better angle. As soon as I did, the legs collapsed and the thing folded up on me, from both sides, like a sandwich. And poor Nibblet was catapulted through the air. The bad news is that I was trapped in that contraption for far too long before I managed to wiggle my way out. Yes, I looked pretty silly. The good news is I actually caught Nibblet in mid-flight! When we both finally regained our composure I discovered it was too dark to get a descent picture. We were outside, it was mid-day, and my camera was telling me to use the flash. It’s been drippy dreary gray here for weeks. I took a few pics anyway, then it started to rain. We called it a day and ran inside. And it’s the summer solstice! Though this is pretty typical weather for June in the Pacific Northwest, some sunshine would surely be nice. Nibblet thinks so, too! 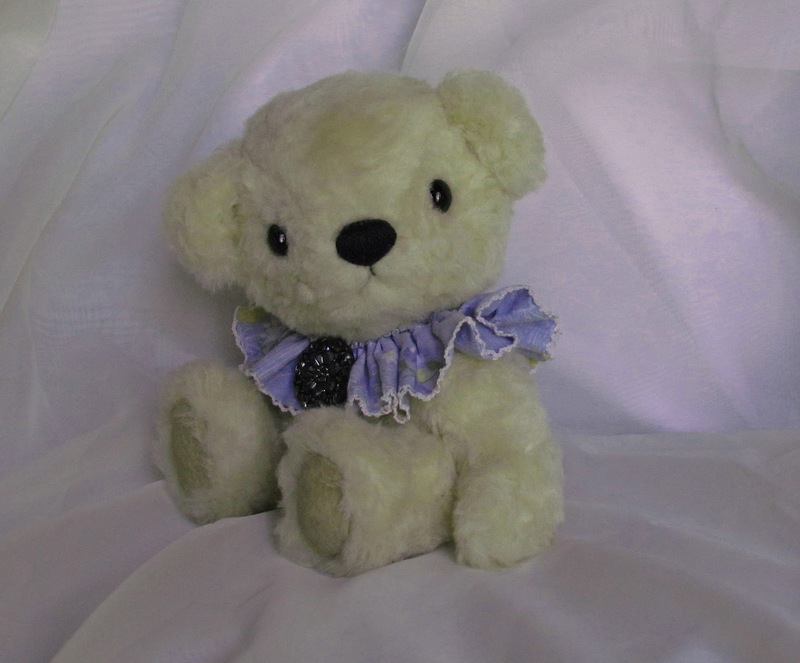 Wesley Weebundle is his cousin, Wee Whisper Winkle is a second cousin, once removed, and Madame Lily Petal is his great auntie. Matty is a wee bit over 7 inches tall. 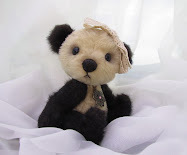 He has black glass eyes, embroidered nose and mouth, and is fully jointed. 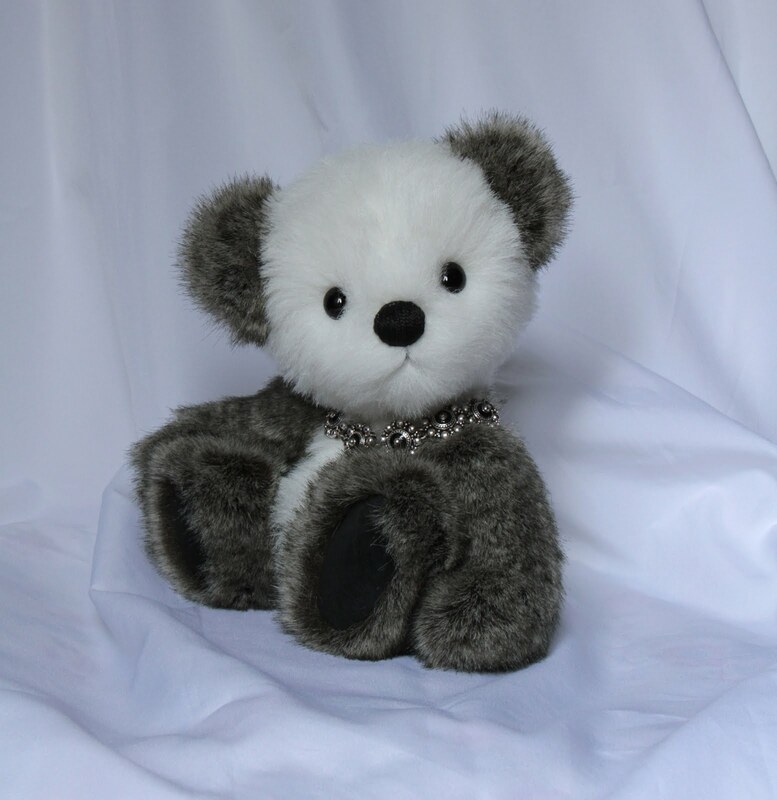 He’s made from a luxuriously plush faux fur coat, which mats easily, hence his name. 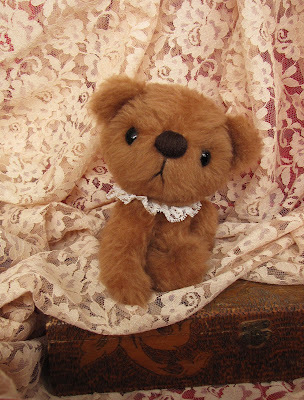 Wesley is my latest teddy designed from the same pattern as Wee Whisper Winkle and Madame Lily Petal. It’s amazing how many different ideas can come out of a single little pattern. 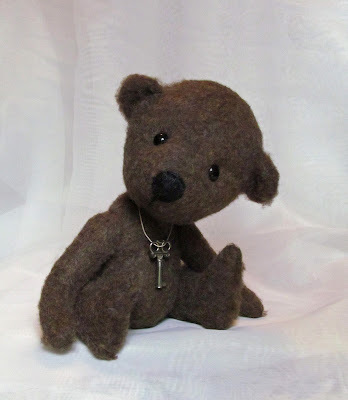 Wesley was made from a piece of fur I found at an estate sale last year. Sure wish I had more of it, it was really super to work with. And only cost a dollar. I love estate sales! 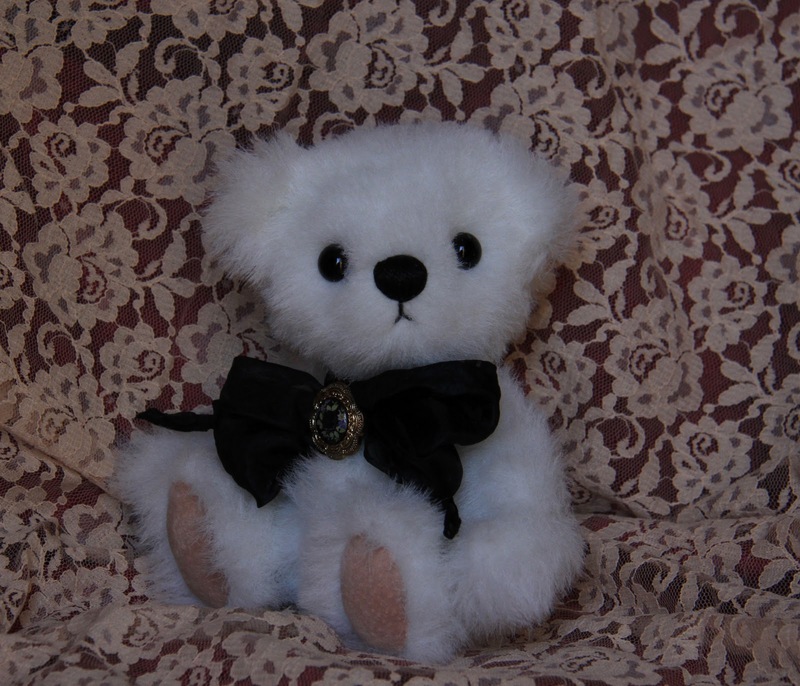 Wesley is 7 inches tall, fully jointed, has black glass eyes and a pearl cotton embroidered nose. He has joined the living room gang, I mean hug, and has settled in nicely with his many brothers and sisters. 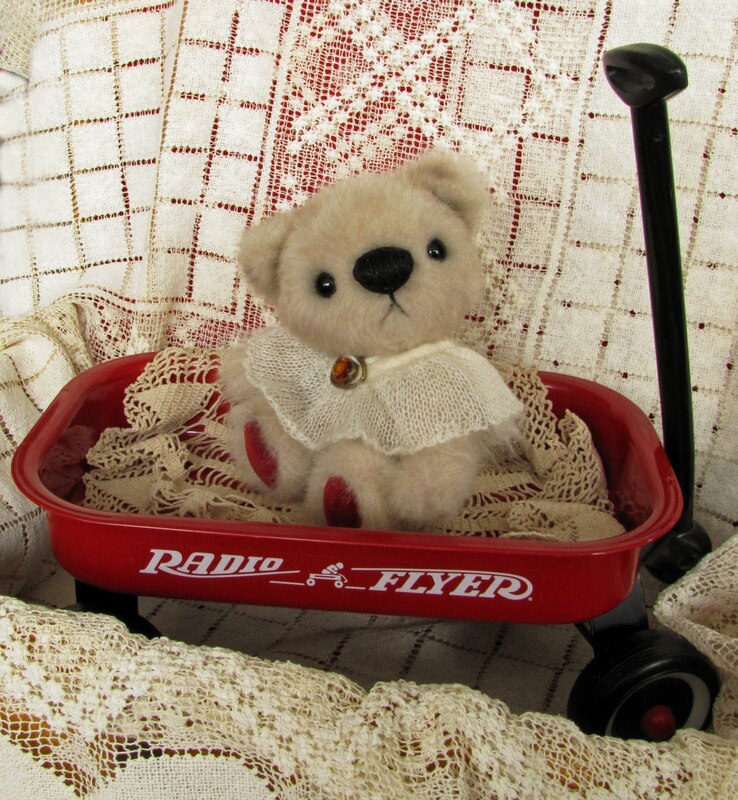 I’m working on a new teddy. I’m using the same pattern, but this time around I’m using a much longer fur. The fur is from a vintage coat and is multi-colored in browns and whites. I’m curious to see the outcome, and if it works or not. The bear may get lost in long fur. Kindly meet Clarissa. 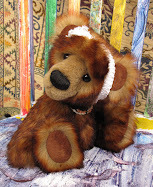 Clarissa is 12 inches tall and made from a dreamy, super soft, super-dense, vintage fur coat. Her paw and foot pads are a soft leather, also from a vintage coat. She is a dream to cuddle with! Not really sure what I was doing, I trimmed her face bit by bit. I also did some needle sculpting. 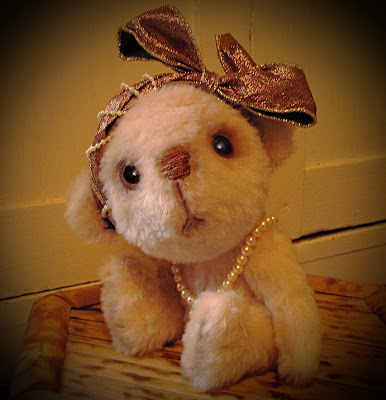 I gave her large eyes, for that darling wide-eyed look, and embroidered her nose with pearl cotton. 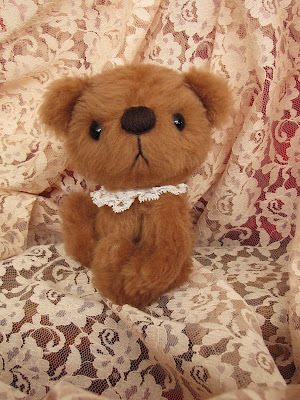 I’m very pleased with little Clarissa, if that’s okay to say! It took me longer than usual to finish her, as I’ve been distracted with this mini-obsession of designing an anime teddy. I finally have a complete pattern drawn and cut out and I’m anxious to see it in fur. Hopefully tomorrow. It may not qualify as a true anime bear, as it’s kinda my interpretation of, and a bit larger than, the norm. I’m anxious to see how my little misfit anime comes out. Kindly meet Edward Thomas. Excuse me, Sir Edward Thomas, as he’s insisted on being called. He’s a little guy, for me, only about 8 inches in height. 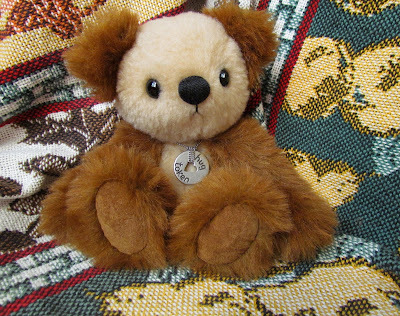 He’s made from a really funky faux fur coat I found at a garage sale last summer. 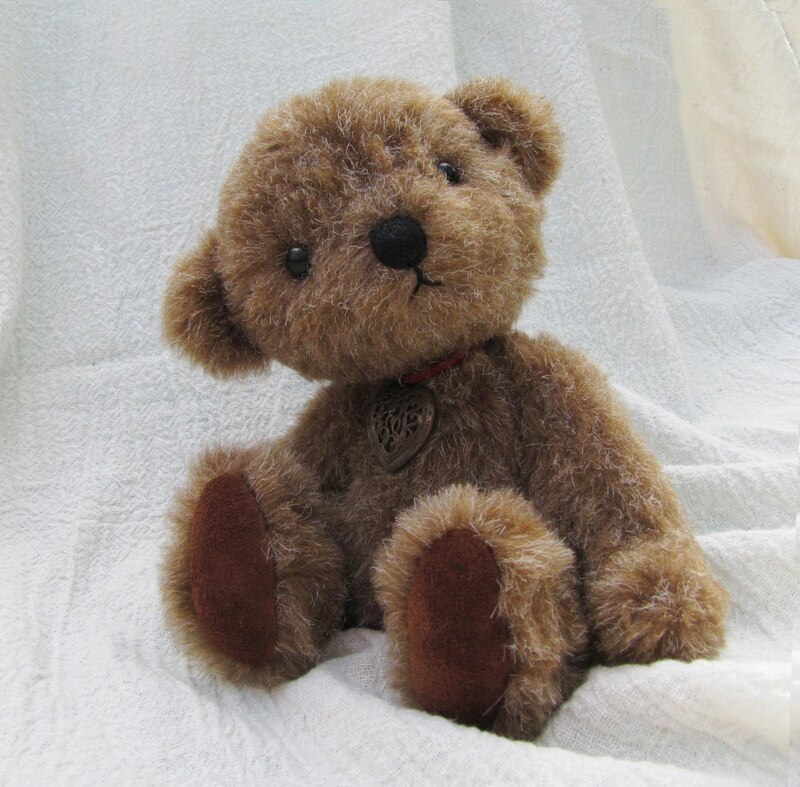 The short dark brown fur swirls in every direction. Really cool fur, but not easy to capture in photos. I was playing around with design, again. I always do the head first. 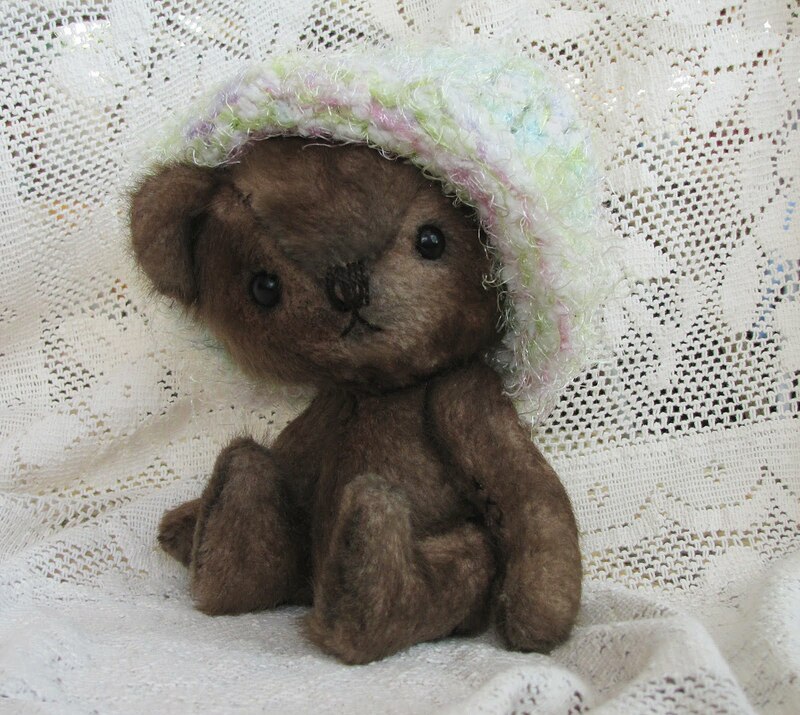 After attaching the eyes and embroidering on the nose (I don’t add the ears until the bear is complete) I found myself looking into the eyes of ET! Gadzooks! Not what I was going for at all. Somewhat flustered I was ready to, well I won’t say for fear Edward will hear, but you-know-what. Then I realized he deserved to be finished, no matter what he wound up looking like. After putting him all together, with ears firmly attached, I sighed a sigh of relief. He looked like a bear after all. 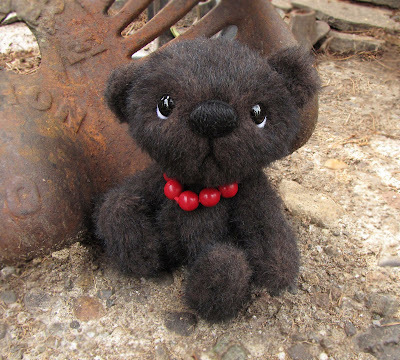 Perhaps a bit different, but a bear nonetheless. 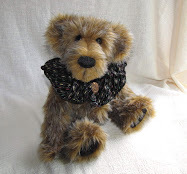 I’m working on a long furred teddy. This fur is really gorgeous. It's a lovely mingle of browns. It too is from a coat, but this one I bought off eBay. Just couldn’t resist! 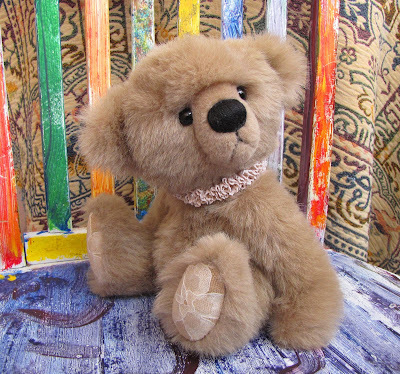 Kindly meet Humphrey, the newest addition to our ever growing teddy bear hug-menagerie. 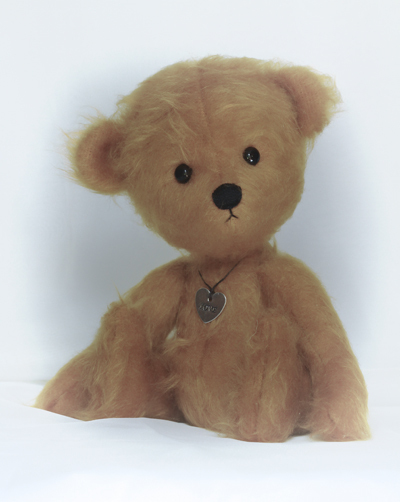 Humphrey is made from a vintage faux mink fur coat. I love working with these vintage coats. The fur backing is slightly stiffened so they’re easy to work with and they don’t need to be lined. Humphrey is 12 inches tall, fully jointed, with premium glass eyes and a pearl cotton embroidered nose. 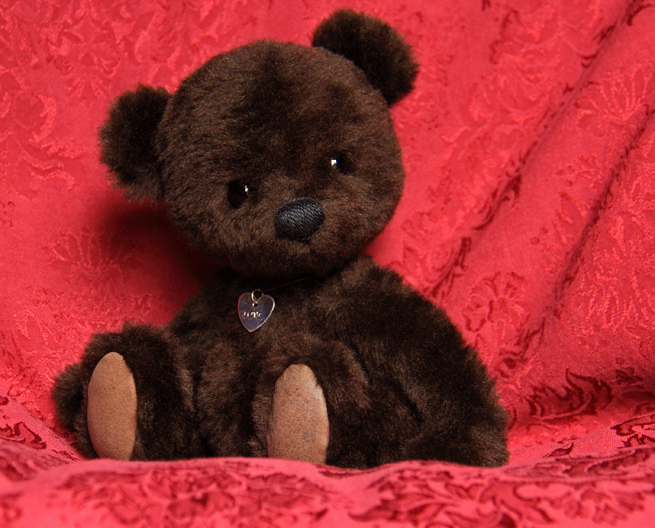 His little paw and foot pads are a soft leather suede. I covered his foot pads with lace, which he thinks is too girly. 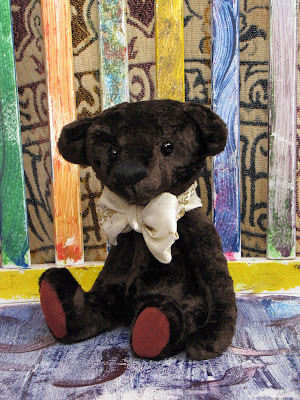 Humphrey fell in love with this wildly painted chair that’s in my studio and insisted his photo shoot take place there. What could I do but oblige. 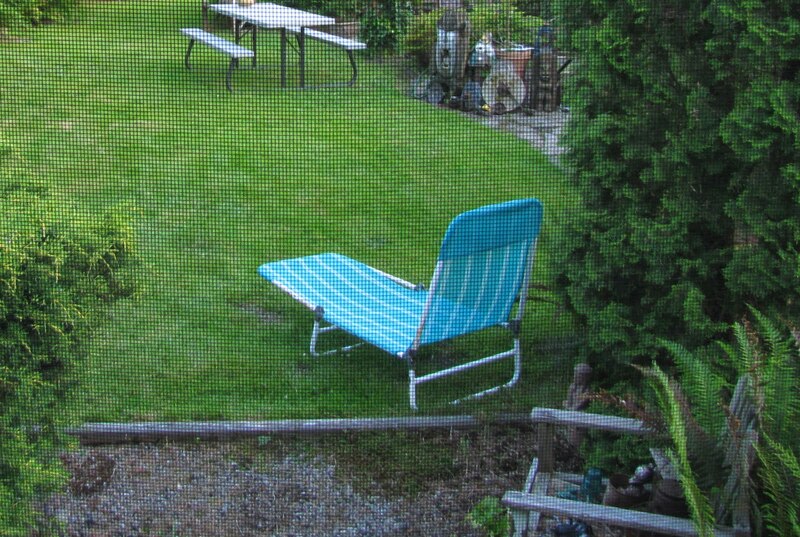 And I must admit, I too love this chair. When we got home Humphrey ran into the living room, jumped up on a chair where Wendell, Eldwin, Hobbs, and Lacey were sitting and wiggled his way in, nice and comfy like. And being happy friendly teddy bears, they welcomed him with open arms. I am permanently passionately hooked on teddy bears! I can't think of a better time to start a blog than the beginning of a brand new year. 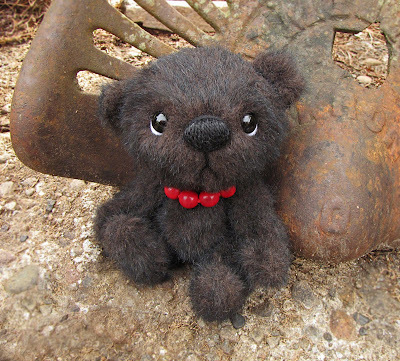 I have a passion for bear making. I love creating these loveable huggables. I'm hooked, I'm obsessed. I'm still learning, I'll never stop learning. I hope to be putting many happy teddies on my blog, as I (hopefully) progress as a bearmaker. I hope you'll take this journey with me. I'm off to stitch and stitch.